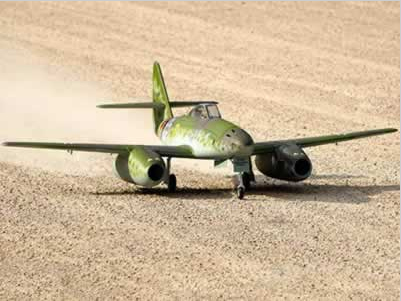 The Freewing Messerschmitt Me 262 is here looking and flying like a champ! She has very scale features that make her look like "the real thing." The positive reviews are rolling in. This one is a winner. From her powerful 60A ESCs powering her new upgraded brushless motors and 70mm EDFs (this baby is FAST- about 100MPH now! ), to her ULTRA COOL retractable landing gear. Other features to drool over: dual split flaps, nylon hinges on all control surfaces, and the motors , EDFs and ESCs are all pre-installed! NOTE: Steve thinks that Freewing planes are GORGEOUS, but that a number of them are unnecessarily weak in some important structural areas. Although we only offer these with reinforcement anyway, we highly recommend that you reinforce your Freewing planes! We also recommend getting the SUPERMAX Crashproofing, and if you want to go all the way, click here to email us about the additional NOSE REINFORCEMENT UPGRADE which really beefs the nose up but good! Canadian Customers: This product is too large to ship via US Postal Service. You MUST select UPS for shipping method during checkout. 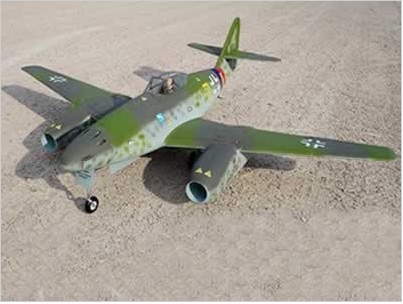 Dual 60A Hobbywing ESCs and powerful 2150kV brushless motors give the Me262's twin EDFs the thrust to reach speeds in excess of 100 MPH !